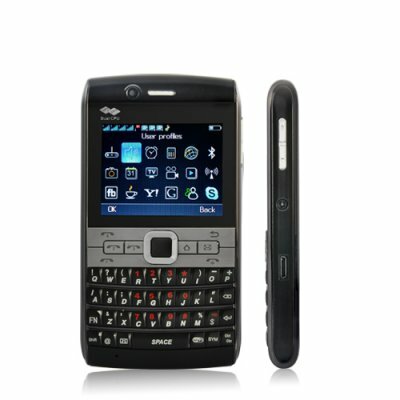 Successfully Added Quattuor - Worldwide QWERTY Cell Phone with Four SIM Card Slots (WiFi, Quadband GSM) to your Shopping Cart. Say hello to the Quattuor unlocked QWERTY mobile phone which comes with 4 (yes four!) SIM card slots, WiFi, Gmail, lots of tools and multimedia features to keep your life organized and easy. It’s a must for those who have to be at the forefront of leading edge technology. With four SIM slots, you can have one for work to be on call and accessible with one SIM card dedicated entirely for work purposes, one for family to be always reachable 24/7 just for your precious family, one for friends to get most of your phone calls and not miss out on anything fun, and one for travel to keep an international pay-as-you-go SIM card ready and available while you are travelling abroad. Keep your private number truly private and life and work truly balanced is easy with the Quattuor Worldwide QWERTY Cell Phone! Check out the full QWERTY keyboard to make it easier for you to compose and send SMS, emails and search queries, and the dazzling array of full featured functionality, including: WiFi, dual - camera and camcorder, video and music player, FM radio, e-book reader, analog TV, Bluetooth, Java, and best of all direct access to Skype, Gmail, Facebook, MSN and other useful applications to keep you connected with the world anytime anywhere! As always, Chinavasion brings you the latest electronics from the world's factory (China) at an unbeatable wholesale price. To see this phone in action and make some serious profits as a drop shipper or a reseller, click "Add to Cart" right now, and in a few days this amazing quadband quad-SIM QWERTY cellphone will be yours! Full QWERTY keyboard for easy texting and navigation!